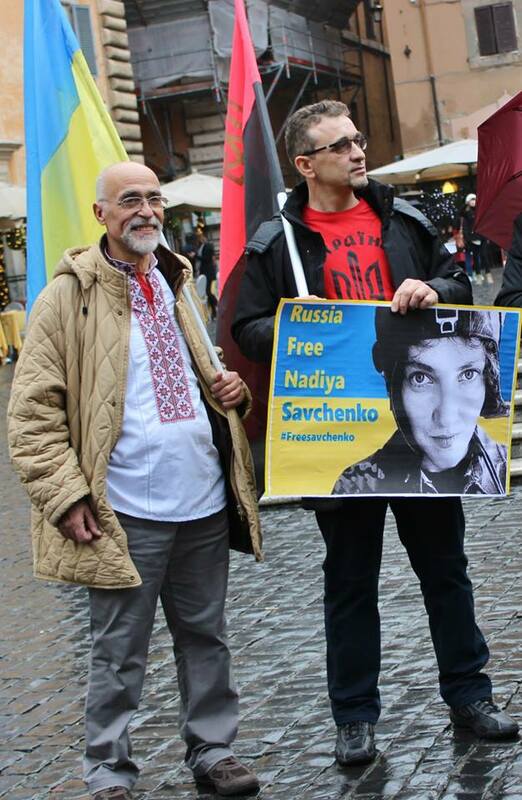 Yesterday (Jan. 11), Mark Feygin, the attorney for Nadiya Savchenko–a former Ukrainian pilot and now Member of Parliament who was kidnapped and abducted to Russia and is being illegally held on false charges as a Russian captive (perhaps hostage is closer to it)–tweeted an open call for worldwide participation in the January 26th global campaign to support Savchenko, now on her 31st day of a hunger strike in a Russian prison. 4 days ago she was put into solitary confinement for continuing her hunger strike. She takes only warm water and recently a glucose drip, adding only a cup of tea for Ukrainian Christmas. Today (Jan. 12), her lawyer Mark Feygin finally got a chance to meet with Savchenko with an intention to try to get her to stop the hunger strike, as she’s stated she wants to continue until the 26th. Previously, such entreaties by Batkivshchyna Party leader Yulia Tymoshenko were not heeded by Savchenko. And today, she reiterated that she will continue her hunger strike until she is on Ukraine’s soil or dies in a Russian prison. “I have given my word that ‘Until the day I return to Ukraine, or until the last day of my life in Russia!’ and I will not back down, otherwise what value would my words have?! – she writes in her letter today. (Full translation of her letter here). Nadiya Savchenko is an elected member of Parliament (Batkivshchyna Party), the hope is that with full delegate authority in PACE she will gain diplomatic immunity and the government of the Russian Federation should release her from custody. This was announced by her lawyer. However, that immunity may only exist for the delegate’s country of origin and not extend to Russia as Russian authorities are claiming. PACE President Anne Brasseur is visiting Kyiv on January 15-16 and perhaps some possibilities may still be worked out. In a separate tweet he also wrote that for the January 26th action there are “no chiefs, no organizers, and so on.” “Coordinate yourselves, organize yourselves” – the lawyer added. Other goals are to raise global awareness of her plight as her hunger strike continues, to put pressure on media and politicians to raise their voices in outrage over her continued imprisonment under falsified charges and that of other Ukrainian political prisoners of war being held illegally by Russia (it is said that Ukrainian filmmaker Oleg Sentsov is supposed to be released sometime this month by RF authorities but it is entirely unclear when). The Ukrainian captives are unable to get POW status because they are caught in a loophole without an official declaration of war or invasion by either side in this situation. This would de facto make them hostages, even though they are clearly POWs and political prisoners. 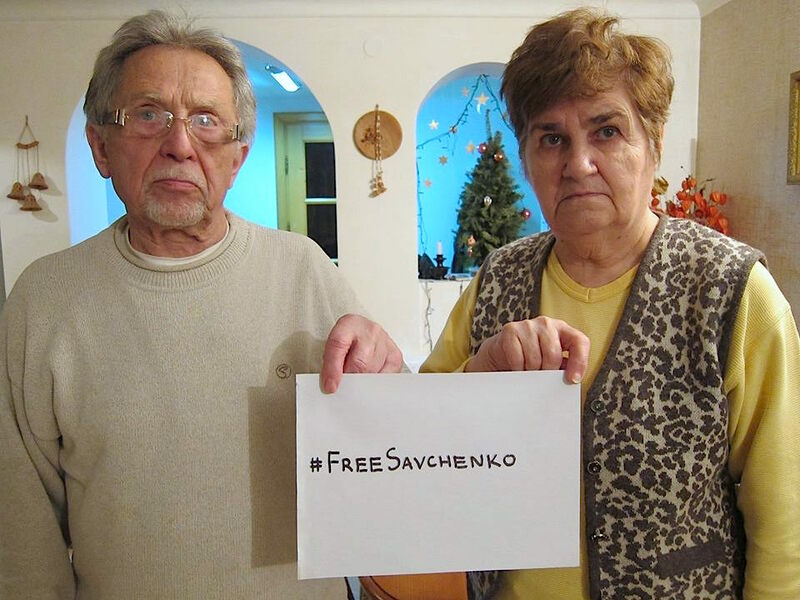 Please have a selfie image like the ones below holding up the #FreeSavchenko hashtag sign prepared to tweet on or before January 26. Take it to hold near something iconic where you live, use your own language as well as the hashtag, let us know where you’re from in the world! Put it on your puppy or cat. The purpose of this kind of photo is to give the media some human interest images to show if they report on the action (and we want to encourage them to report as much as possible as one of the goals of the Twitter storm), so remember to also tweet it to your local or favorite media people. 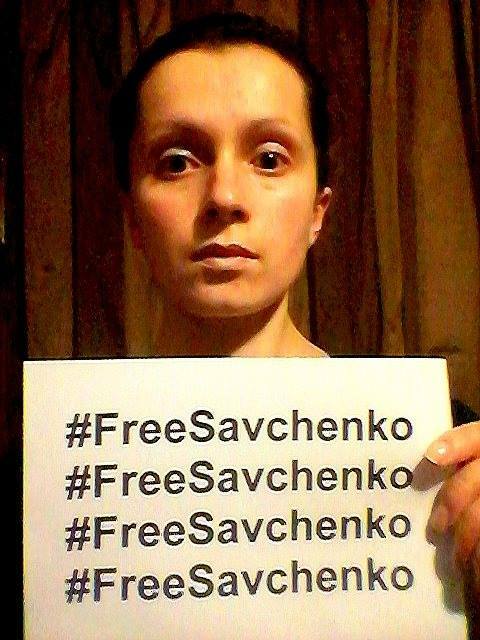 Don’t forget to use the hashtag #FreeSavchenko for every single tweet! We need to take the total tweets to 1 million together! And keep tweeting and retweeting the ones at #FreeSavchenko. If you don’t use Twitter, please feel free to send your images here or post them to our Voices of Ukraine–Official FB page. This entry was posted in "Voices" in English, #Free Savchenko, Appeals, English, Pictures, Social Media and tagged #FreeSavchenko, #Nadiya Savchenko, POW, Ukraine. Bookmark the permalink. 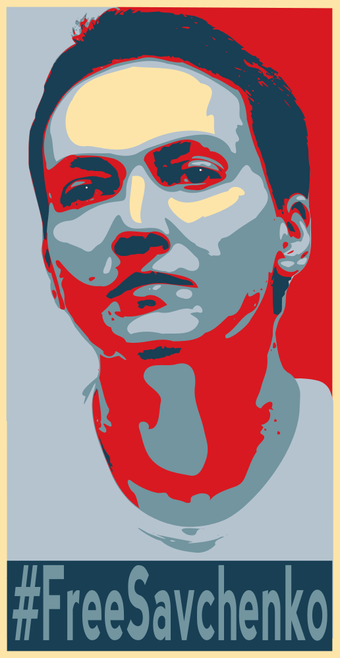 They say that N. Savchenko was recently transferred out of her prison cell to a certain hospital because her health naturally deteriorated due to the two months long hunger strike. Many journalists suspected that Sergei Magnitsky was assassinated in the “hospital” by “doctors” and I guess it is not unusual because that is what the Soviet “medical” science, a non-science in truth, was all about. At least, it is perfectly clear that the Moscow “hospital” in question is a totally incompetent facility to offer any “medical” treatment to people in dire need like Savchenko herself. 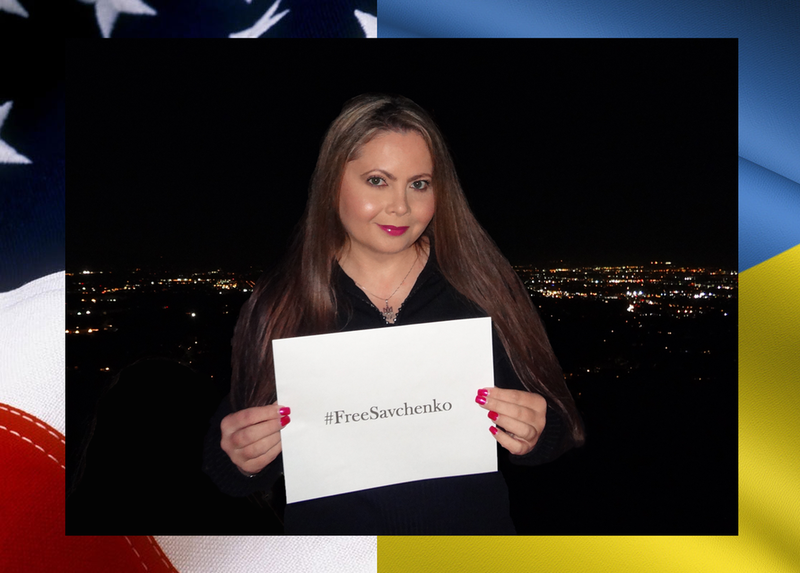 I hope to see the Ukrainian President and the leaders of the West do much more to force the Kremlin to transfer her now to a third country in the EU or the US to treat her without delay in order to save her life. This is a very serious humanitarian issue, as they can all see clearly. Still, the loss of many lives in the occupied territory of Ukraine ( and elsewhere like Mariupol recently ) is not a statistical issue. True leadership does not treat human cost that way: instead, a true leader minimizes such human costs in order to preserve the human resource of his own country for future prosperity. Therefore, the Ukrainian President needs to protect his own troops as well as the civilians at the same time by giving them the best armour available. 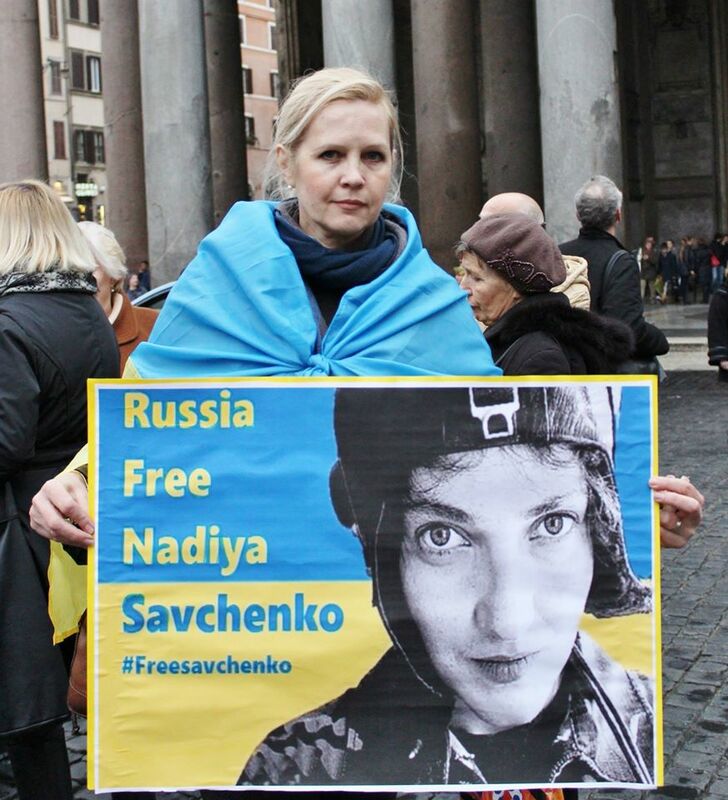 Hopefully, the Ukrainian President and other leaders of the West will do what they have to do to “free Savchenko” immediately and triumph over the murderous Kremlin, now. Hopefully, they will also destroy or neutralize the modern day “Ho Chi Minh trail” in S-Eastern Ukraine and place the border under lockdown in order to mop up remnants of the Russian guerilla forces in Ukraine sooner rather than later.